If you choose to create a manual playlist, it will remain empty until you add videos to it. Thus, the next step is to add videos to your manual playlist. 1. On the Zype navigation menu, click Playlists. 2. On the Playlists page, look for the manual playlist you want to add videos to, then click the Manage Videos button to the right of the playlist. 4. On the Add Video to Playlist window, you’ll see any uploaded videos here. 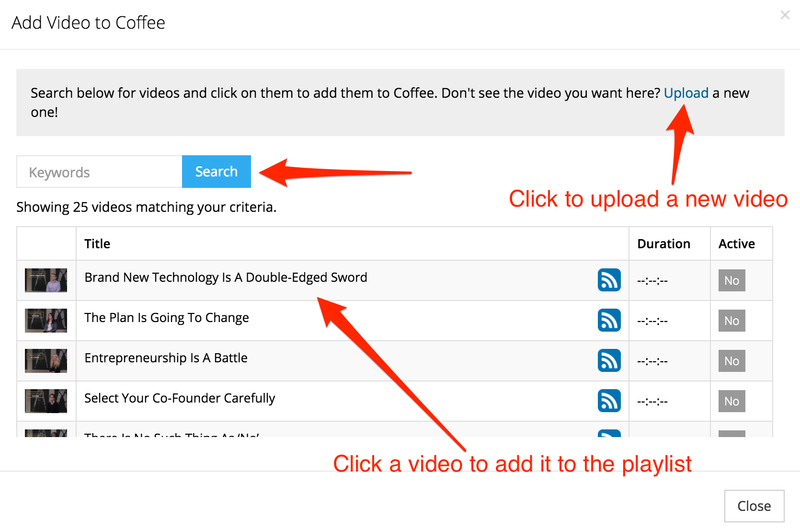 To add your preferred videos, select them from the list. If you have a large library, enter a keyword on the Search bar, click Search, then select the video that matches the keyword. If you haven’t uploaded videos to your library before, you may upload a new video by clicking the Upload link at the top. For more details, see Uploading Videos from your Web Browser. 5. Once you finish adding videos to the playlist, click Close. Now that you’ve added videos to the playlist, and if the playlist is active, the videos in the playlist can be viewed anywhere you post your content. Any videos that are set to inactive inside the playlist will not be available for consumers to watch.